"Germinate 3 fills a role not offered by other plant genetic resources software platform. In short, it is capable of integrating both genotypic and phenotypic data with passport data"
Crop wild relatives (CWR) are the wild ‘cousins’ of our cultivated crops, and are important because they contain useful genetic diversity, some of which is not present in cultivated crops. They also need protection in the face of threats such as changes in land use, the intensification of agriculture, climate change, overgrazing, and foreign weeds. An international research initiative led by the Crop Trust aims to collect many of the most important species of crop wild relatives, ensure their long-term conservation, and facilitate their use in breeding new, improved crops. Part of the work includes the management of pre-breeding projects on 19 crops, including staples such as barley, durum wheat, sorghum and rice, which can generate enormous amounts of data. Researchers of the James Hutton Institute are teaming up with Crop Trust colleagues to ensure pre-breeding data is available to breeders and scientists via a series of web portals using the Institute's generic plant genetic resources database, Germinate 3. Germinate 3 is an open-source plant database platform on which complex data from genetic resource collections can be stored, queried and visualised, including data types like passport, phenotypic, field trial, pedigree, genetic, climatic, geographic location data as well as user annotations. 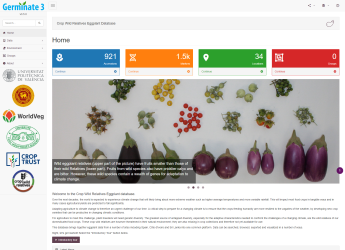 Dr Paul Shaw, a senior scientist within the Institute's Information and Computational Sciences group, said: "We wanted to create a tool so that researchers and breeders can share data about various crops on a customizable, yet common, platform. So we developed Germinate, which is a database system that can be used to view and select plant genetic resources data and then analyse it using various graphing tools. Germinate 3 fills a role not offered by other plant genetic resources software platform. In short, it is capable of integrating both genotypic and phenotypic data with passport data." As work progressed, it became apparent that Germinate 3 – the latest version – would be a perfect fit for the project's pre-breeding data. Hannes Dempewolf, Head of Global Initiatives at the Crop Trust, commented: “In 2014, we began looking at Germinate 3 as a platform for us to share our pre-breeding data with the world. We wanted an easy-to-use tool that allows users to drill down through our massive datasets and make decisions which would help in their breeding or research activities. We felt the James Hutton Institute was ideally suited to lead this effort due to their experience in handling similar data." The James Hutton Institute has developed several external programs which provide user-friendly management of large datasets. Helium can help breeders determine the ‘genealogy’ of a plant line. Flapjack helps users compare lines, markers and chromosomes by visually displaying similarities. CurlyWhirly can help users find patterns and outliers in the data. Thus far, the Hutton team have created Germinate 3 pilot projects for rice and sunflower and have just released an eggplant database using Crop Wild Relatives pre-breeding data. Whereas the species may differ, the approach taken ensures that the tools are compatible across all database uses, and developments made for one crop can benefit other crops. In other words, Hutton work on the rice project will benefit the Crop Wild Relatives’ durum wheat project as well. The CWR pre-breeding projects will continue to generate important data that will help plant breeders improve key food crops, making them more resilient to climate change. With Germinate 3, plant genetic scientists and breeders can rest assured that this data will long remain readily available on a versatile and powerful platform.